No bones about it, this week the fourth graders had fun with bones. We were doing the FOSS lesson comparing bones. We stepped it up a notch. We have a school forest that our 5th graders always do an owl pellets lesson, so we had to fill it with an introductory lesson. First I read the A to Z book Animal Skeletons. I used my new Ipad to read it and show it. I then had the kids guess the animal using What's Inside Animals. 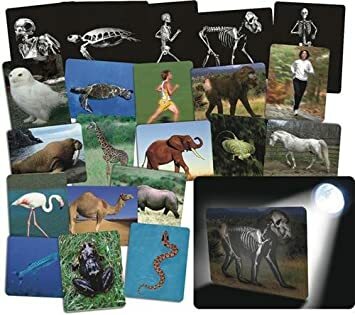 Coolest thing ever... there are 16 cards that have a skeleton on one side and the animal on the other. If you use a flashlight, you can see the bones inside the animal. The kids love it! This product is by Roylco. Such a neat lesson! I did bones at the start of the year with my 4th grade group, I will have to look into the roylco product for next year!